Pep Guardiola and Jurgen Klopp have led a number of Premier League managers in saying they would be prepared to take their players off the pitch in a bid to combat racist abuse. Manchester City boss Guardiola believes racism is “getting worse” in Europe. Liverpool’s Klopp says football “has to do everything” to prevent racism, while Tottenham manager Mauricio Pochettino said “no-one deserves to be abused”. “If that happens, I am the first to say, ‘Stop, we are not going to play'”. Spurs defender Danny Rose was among the England players to report hearing monkey chants during England’s 5-1 win over Montenegro on Monday. Cardiff manager Neil Warnock said punishment has to be more severe than it is now, suggesting teams whose fans were responsible for racist chanting could be kicked out of a tournament, while Chelsea’s Maurizio Sarri suggests a 10-minute break in the first instance. 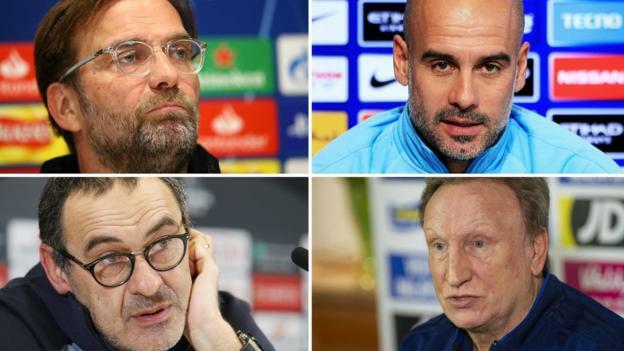 The issue of how football should tackle racism was one of the main talking points as Premier League managers faced the media before this weekend’s matches. It comes after England players – including City’s Raheem Sterling, Chelsea’s Callum Hudson-Odoi and Tottenham’s Rose – were targeted by during the Euro 2020 qualifier in Montenegro. After Sterling scored England’s fifth goal in the 5-1 win, he celebrated by putting his hands to his ears and later said the gesture was a response to the racist abuse. England manager Gareth Southgate said he heard abuse directed at his players and the incidents were reported to Uefa, which has charged Montenegro with racist behaviour. “The situation only changes when you do something. When you do nothing it just stays the same,” Guardiola, 48, said. “Football is a strong weapon to defend the principles of humanity,” he added. Napoli manager Carlo Ancelotti said his team asked three times for their match at Inter Milan in January to be suspended because of alleged racist chanting. In January 2013, AC Milan player Kevin-Prince Boateng sparked a walk-off because of racist chants in a friendly between his team and Italian lower division club Pro Patria. Italian Sarri, who spoke out against Chelsea fans accused of racially abusing Sterling in December, says a rule which allows a match to be stopped needs to be introduced across the sport. “In every country there are some stupid people, I think. So it’s a big problem. I think that we need to do something different,” Sarri, 60, said. Klopp says he would have no qualms in taking his players off the pitch depending on the severity of the situation. “Whatever I could do, I would do. We have to stop games, we have to do everything,” the 51-year-old German said. “If it’s the whole stand, then I would do it 100%. But that’s too much power for one or two idiots or three or four idiots. “If I take the players off and somebody says, ‘It was not that serious’, you lose the game – our job is to win football games. Englishman Warnock said he would not hesitate to take action himself if the match officials had been told about racist abuse towards players but not acted on it. “I would take a team off if that’s what happened, the referee was informed and didn’t do anything about it,” the 70-year-old said. Walking off the pitch would have little impact and only serves to punish those fans not involved in racist chanting, says former England midfielder Jermaine Jenas. Jenas, 36, believes teams whose fans racially abuse players should be banned from Uefa competitions or given points deductions. “The majority of people going to games are good people, kids, who just want to watch a game of football,” he told BBC Radio 5 Live’s Friday Football Social. “I’m not 100% sure they should suffer. “All this behind closed doors stuff doesn’t really work for me and fines don’t really do enough. We need to start hitting people where it really hurts.